Aberdalgie Old Parish Church. Gravestone commemorating Margaret Imbrie, d.1775. 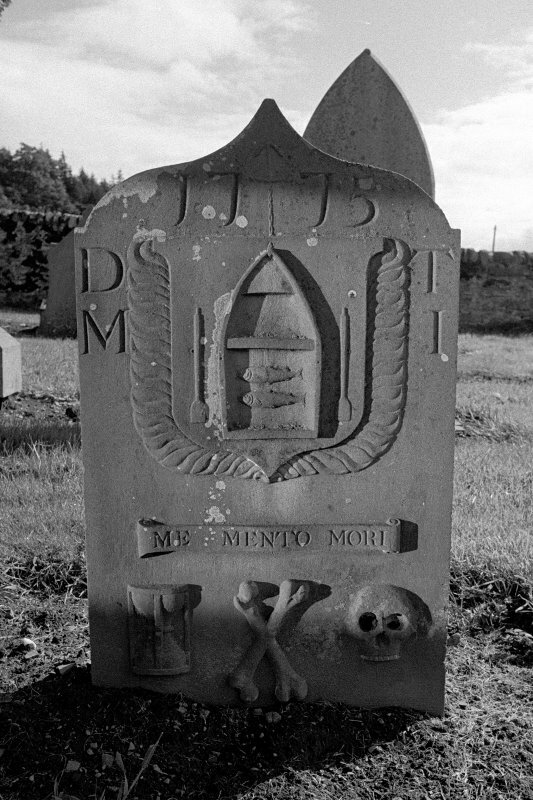 Boat containing two fish; intials D T and M I; 'MOMENTO MORI' scroll, hourglass, crossbones and skull. For present parish church (NO 0795 2025), see NO02SE 88.00. The old parish church of Aberdalgie fell into disuse, and was demolished after the new church (NO02SE 88) was built in 1773. Some portions of the walls were standing until 1820-30, but not even the foundations are now visible. The local inhabitants state that it was a pre-Reformation church. The parishes of Aberdalgie and Dupplin were united in 1618. The parish of Aberdalgie was one of several in which, for some years after 1560, the Romanist party was able to keep possession of the church, and to make it impossible to hold Protestant sevices. Visited by OS (W D J) 28 October 1965. Aberdalgie (Dunkeld, Fife and Strathearn) was apparently closely connected with the mensal church at Tibbermore; this church also pertained to the Bishop of Dunkeld at the Reformation. The old burial ground of Aberdalgie occupies a narrow terrace on the steep E-facing slope of the Milltown Den below, and 60m NE, of the present parish church (NO02SE 88). Nothing is visible of the old church, but the burial-ground contains numerous eighteenth-century headstones and table-tombs. A medieval grave-slab is built into an arched recess in the S wall of the present parish church. This commemorates Sir William Olifard or Oliphant of Aberdalgie, defender of Stirling Castle in 1304 and signatory of the Declaration of Arbroath in 1320. The stone lay over his grave in the church of Aberdalgie until the demolition of the building, after which it lay exposed to the weather for about seven years. In 1780 a stone slab was placed over the graveslab as a roof, but it continued to suffer considerably from weathering. The slab measures 2.5m in length by 1.32m) in breadth and 0.7m in thickness, and bears an incised life-size figure. The face is quite destroyed and the canopy over the figure is the best preserved element of the design. This consists of three cusped arches: beneath each side-arch there is a shield, the one on the sinister side bearing the Oliphant arms, the other almost defaced. The borders on the sides have been richly carved. Each is divided into four niches, all of which have contained figures, but only one is now entire. The border on the dexter side has almost disappeared. All round the stone there has been a raised inscription, of which only a few letters at the top and bottom now remain. At the four corners, the inscription has been blocked by the emblems of the evangelists, but only a part of the emblem of St Mark can now be distinguished. There has also been a geometrical figure in the centre of the inscription, but only one side remains. D MacGibbon and T Ross 1896. Building of a new church. The Earl of Kinnoull is to build a new church and has asked for the plan and section of the church at Buchanan. Letter from David Graeme of Orchill to John Smith. He asks that these should be sent to Buchanan, 1772. Unable to save to Archaeological notes. The William Oliphant Memorial Tablet is situated horizontally, within a niche built into the south wall at the east end of Aberdalgie Parish Church, Perthshire. The memorial was subject to survey and conservation works were undertaken on the subject on December 2005 and January and February 2006. NO 0799 2031 Resistivity and magnetic surveys of Aberdalgie churchyard were carried out. A number of linear features, some of which may be related to former churchyard boundaries, were identified. The surveys failed to find any trace of the former medieval chapel. Archive to be deposited with RCAHMS. Copy of report deposited with Perth and Kinross SMR.